Definition at line 632 of file decode.h. Definition at line 635 of file decode.h. 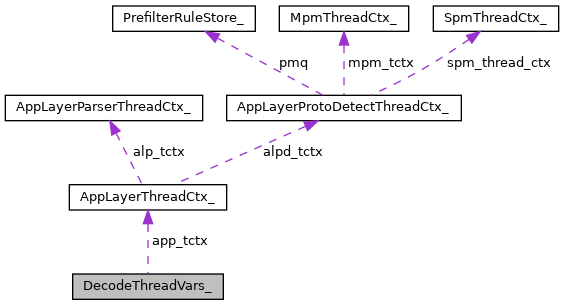 Referenced by DecodeThreadVarsAlloc(), DecodeThreadVarsFree(), DetectFragBitsRegister(), and DetectReplaceFreeInternal(). Definition at line 642 of file decode.h. Referenced by DecodeRegisterPerfCounters(), and DecodeUpdatePacketCounters(). Definition at line 641 of file decode.h. frag stats - defrag runs in the context of the decoder. Definition at line 672 of file decode.h. Referenced by DecodeRegisterPerfCounters(), and Defrag(). Definition at line 673 of file decode.h. Referenced by DecodeRegisterPerfCounters(), and DefragRbFragCompare(). Definition at line 674 of file decode.h. Definition at line 675 of file decode.h. Definition at line 676 of file decode.h. Definition at line 677 of file decode.h. Definition at line 678 of file decode.h. Definition at line 687 of file decode.h. Referenced by DecodeRegisterPerfCounters(), and PacketUpdateEngineEventCounters(). Definition at line 669 of file decode.h. Referenced by DecodeERSPAN(), and DecodeRegisterPerfCounters(). Definition at line 647 of file decode.h. Referenced by DecodeEthernet(), and DecodeRegisterPerfCounters(). Definition at line 684 of file decode.h. Referenced by DecodeRegisterPerfCounters(), and FlowSetupPacket(). Definition at line 685 of file decode.h. Definition at line 680 of file decode.h. Definition at line 682 of file decode.h. Definition at line 683 of file decode.h. Definition at line 660 of file decode.h. Referenced by DecodeGRE(), and DecodeRegisterPerfCounters(). Definition at line 652 of file decode.h. Referenced by DecodeICMPV4(), and DecodeRegisterPerfCounters(). Definition at line 653 of file decode.h. Referenced by DecodeICMPV6(), and DecodeRegisterPerfCounters(). Definition at line 663 of file decode.h. Referenced by __attribute__(), and DecodeRegisterPerfCounters(). Definition at line 645 of file decode.h. Referenced by DecodeRegisterPerfCounters(), and PacketDecodeFinalize(). Definition at line 648 of file decode.h. Referenced by DecodeIPV4(), and DecodeRegisterPerfCounters(). Definition at line 667 of file decode.h. Definition at line 649 of file decode.h. Referenced by DecodeIPV6(), and DecodeRegisterPerfCounters(). Definition at line 668 of file decode.h. Definition at line 643 of file decode.h. Definition at line 666 of file decode.h. Referenced by DecodeMPLS(), and DecodeRegisterPerfCounters(). Definition at line 657 of file decode.h. Referenced by DecodeNull(), and DecodeRegisterPerfCounters(). Definition at line 640 of file decode.h. Definition at line 659 of file decode.h. Referenced by DecodePPP(), and DecodeRegisterPerfCounters(). Definition at line 664 of file decode.h. Referenced by DecodePPPOEDiscovery(), DecodePPPOESession(), and DecodeRegisterPerfCounters(). Definition at line 656 of file decode.h. Referenced by DecodeRaw(), and DecodeRegisterPerfCounters(). Definition at line 658 of file decode.h. Referenced by DecodeRegisterPerfCounters(), and DecodeSCTP(). Definition at line 655 of file decode.h. Referenced by DecodeRegisterPerfCounters(), and DecodeSll(). Definition at line 650 of file decode.h. Referenced by DecodeRegisterPerfCounters(), and DecodeTCP(). Definition at line 665 of file decode.h. Referenced by DecodeRegisterPerfCounters(), and DecodeTeredo(). Definition at line 651 of file decode.h. Referenced by DecodeRegisterPerfCounters(), and DecodeUDP(). Definition at line 661 of file decode.h. Referenced by DecodeAFP(), DecodePfring(), DecodeRegisterPerfCounters(), and DecodeVLAN(). Definition at line 662 of file decode.h. Referenced by DecodeRegisterPerfCounters(), and DecodeVLAN(). Definition at line 691 of file decode.h. Referenced by DecodeThreadVarsAlloc(), DecodeThreadVarsFree(), and FlowGetFlowFromHash(). Definition at line 637 of file decode.h. Referenced by DecodeERSPAN(), DecodeThreadVarsAlloc(), and DecodeVLAN().